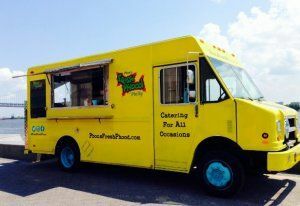 Philly based mobile food truck, poppin' our window on local streets for events here and in the suburbs. Pbon's Fresh Phood of Philly, born in the Capecci's family kitchens, where we watched our mom and grammom's cook. What a better way to fuse our family traditions, than to bring people together and serve our phood to Philadelphia and the surrounding communities. Pbon's Fresh Phood is the only Philadelphia food truck bringing pretzel roll sandwiches with Land & Seafood curbside. We offer a little spice, a twist and a nautical flare. Experience the Pbon with Taylor pork roll, egg and cheese on an exclusive twisted pretzel roll, grilled jumbo lump crab cakes, the Philly Melt, rEVOLution pretzel and basic comfort food such as the s'mores, pb&js, grilled cheese, waffles and other Philly Phavorites. Our food is grilled and locally sourced with gluten free options.